Most of the keynote speakers at ASQ’s World Conference on Quality and Improvement weren’t traditional “quality” professionals. Yet all wove the theme of quality into their presentations, which ranged from what motivates us in the workplace to how to be more interesting (useful when courting potential clients and employers). For May’s monthly theme on View From the Q, we’re breaking with tradition a bit and offering multiple topics for discussion. All are themes that came up at the conference. Yet these subjects are relevant to the quality community far beyond one event. Take a look. Short-term motivators have outlived their use for 21st century work. Dr. Deming figured this out years ago. Fact: Money is a motivator—it’s the standard of normal fairness. Pay enough to take issue of money off the table. Besides money, the three key motivators are autonomy, mastery and purpose. The technology for engagement isn’t management, but self-direction over time, tasks, team, and technique. Do you think Pink and Deming are correct about about motivation in the workpalce? Charm and Fascination (or “Soft Skills): Both Sally Hogshead and James Melton spoke at the conference about making oneself likeable, fascinating, and charming. You may think of these as “soft skills.” Do soft skills matter if you’re extraordinary at the technical aspects of your job? Sally and James said yes! Key takeaway from James Melton: “Treat strangers with the same courtesy as you do loved ones. You will go far.” You never know when that stranger turns out to be a client or an employer. Sally Hogshead said that you don’t have to be the best at your job to be successfu. But you do need to be distinct. How do you make yourself distinct as a quality professional? The Quality/C-Suite Connection: Author Karen Martin spoke about the disconnect between the quality department and the C-suite. It’s a common problem, and one covered on this blog. See: Can We “Sell” Quality? and Baldrige In the C-Suite. How can you, the quality professional, help build a bridge to the C-suite? Karen suggests becoming a coach, teacher, and mentor in your organization. Do you agree? What’s The Future of Quality? Futurist Jamais Cascio laid out his vision of epic global changes in the next decade. How will the quality profession change in tandem? It’s a question of great interest to ASQ. Every three years we conduct a Future of Quality study, anticipating the future of the field and preparing for the changes it will bring. The latest study was done in 2011, and you can read it here (PDF). 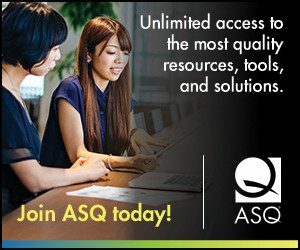 Speaking of the future, ASQ’s just-released Global State of Quality research gives a comprehensive look at the quality function in organizations around the world. The research is certainly helping us plan for the future by uncovering current trends. Look for a more in-depth post on The Global State of Quality later in May. Paul Borawski will be back with additional insights on the research.